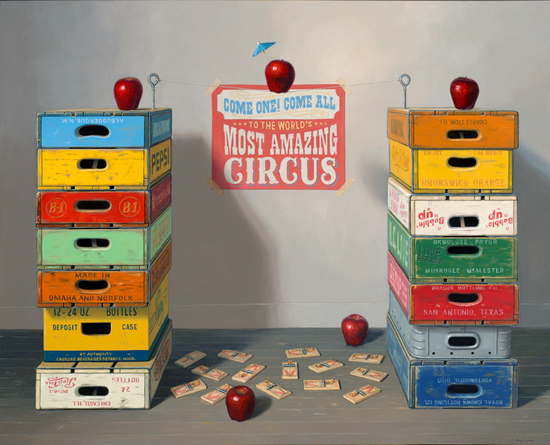 Painter Robert C. Jackson likes things... lots of them. 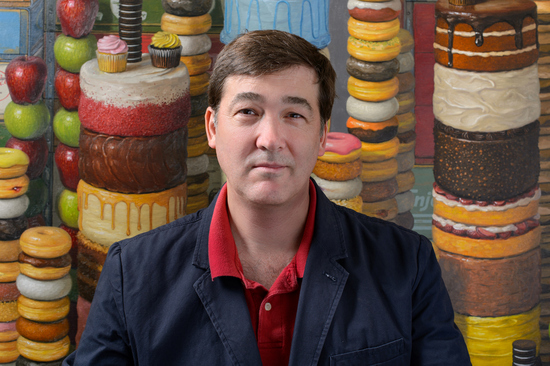 His current show at Gallery Henoch, Tinkering with Reality, is populated by cosmologies of pancakes, donuts, goldfish bowls, apples, oreos, vintage soda crates, and postcards. There is a philosophical vibe to the show -- Thiebaud meets Hegel? 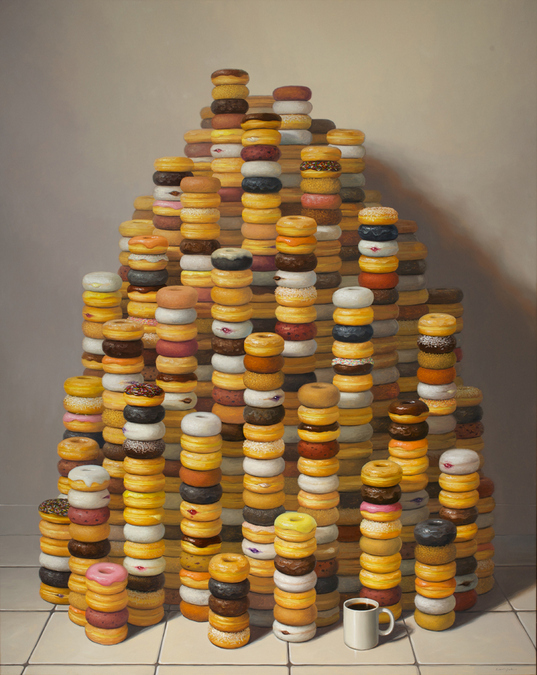 -- and some spiritual connotations as well: Jackson's donuts multiply like the Boddhisatvas in a Buddhist scroll, suggesting multiple realities. 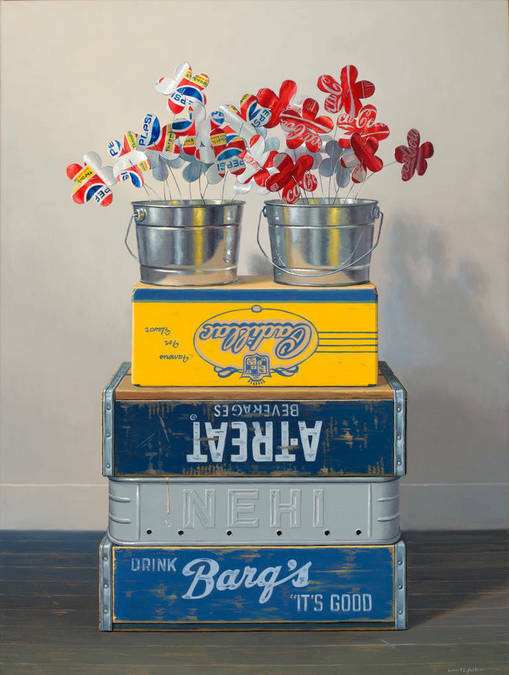 Funny, inquisitive and just a tad moralistic, Jackson's still lifes are conundrums that blend Jackson's affection for Americana and the entire history of the still life genre. 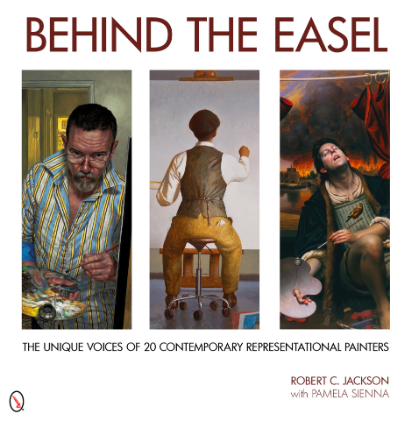 I recently interviewed Robert C. Jackson and asked him about his background, his ideas, and his new book. Tell me about how you transitioned from being an electrical engineer and assistant pastor to a full-time artist. I started painting during the last semester of my senior year at college and knew from that point on I wanted this newly found love as my career. Having an engineering job lined up I was certain I would quit to be an artist one day. I found after 5 years I was so stir crazy to be an artist that I spoke to the pastor of my church and told him I planned to quit my job to go for it. To my surprise he asked if I would make a detour and quit to work at his church. After 5 years I once again became stir crazy about becoming an artist and quit the ministry. The pastor this time said he always knew that day would come. To a certain extent the decision was always blind faith, one never could make a full time living with part time work. I always knew I had to jump in feet first. Have you been characterized as a "Pop" artist? If so, does that annoy you? Honestly, I haven't been too concerned about labels. What's that silly expression, "call me whatever you want, as long as you call me?" There's some truth to that. I love what I do and hope there are some that get it. From interviews and what I've read, Wayne Thiebaud struggled against being called Pop as he saw himself as more of a painter than the Pop movement. That being the case, I strongly identify with being a painter myself, but if Pop means that my work is speaking to a contemporary society I don't mind that. You seem to like things.... LOTS of things. Is your art, to some degree, about glut? I do tend to think of my art in different groupings; food fights, wall of crates, dilemmas, quests for immortality, art dialogs, and some I call excess paintings (and of course some mix these). Funny to see your word "glut" as I suppose that is a more bombastic form and possibly dark side of excess! But yes, they are about abundance, desire, want, collecting, amassing, and the extreme. I'm going to answer this both personally and artistically. Personally, I try to live by grace and would like to think I view others with that in mind and attempt to offer it freely. Of course I am a far cry from being successful at that, but I do believe in believing the best and keeping a non-judgememtal and open spirit. Artistically, I really feel strongly about a healthy marriage between concept and craft in art. I've even drawn quadrant diagrams thinking this through. Representational painters can fall into the trap of focusing 95% of their energy on craft at the expense of concept because well-handled painting is so alluring. Though, a low concept painting can't be salvaged by high craft. So I do spend quite a bunch of time brainstorming and hope it bears fruit. I'd like to have concepts that are enriching and challenging. I'm betting that you collect art and objects: am I correct? I am definitely a creature of habit and routine. Ever since I was a little boy, every Jefferson Nickel I get as change, I check the date and if it is earlier than 1964 (the year I was born) I save it. They aren't worth anything at all, it's just something I enjoy for a reason I can't even explain myself. I own all the crates that show up in my paintings. My art book collection has gotten a little out of hand. And yes, I love to collect and look at other artist's artwork. Very little of my own artwork hangs in my house. Mostly contemporaries that make me stand in shock and awe. Your art strikes me as aiming to appeal broadly: to "art" people and everyone else. Is making a wide connection one of your aims? YES! Many artists say their ultimate goal is to paint only for themselves. Of course I admire that and embrace much of that, but I see myself as wanting to create work that speaks to people. Otherwise why show it in public? I love revealing my inner dialog in a way in which others can in turn continue the dialog when viewing the work. I find it a rewarding challenge to create work that speaks AND can be heard. 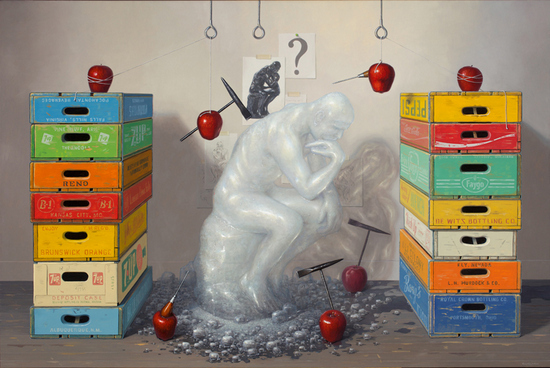 Artists: Steven Assael, Bo Bartlett, Debra Bermingham, Margaret Bowland, Paul Fenniak, Scott Fraser, Woody Gwyn, F. Scott Hess, Laurie Hogin, Robert C. Jackson, Alan Magee, Janet Monafo, John Moore, Charles Pfahl, Scott Prior, Stone Roberts, Sandra Mendelsohn Rubin, Daniel Sprick, Will Wilson, and Jerome Witkin. In the foreword to your new book you say that "The last thing I want to do is be a writer" but you managed to get this book put together. What motivated you? Really it's my belief that this book needed to be done and it wasn't going to happen unless I did it and so I created the book I wished I had. I'm pretty passionate about art and artists and wanted to provide another platform for these artists to have their voices heard. I have 2 copies of John Arthur's "Realists at Work" that was published in 1983. 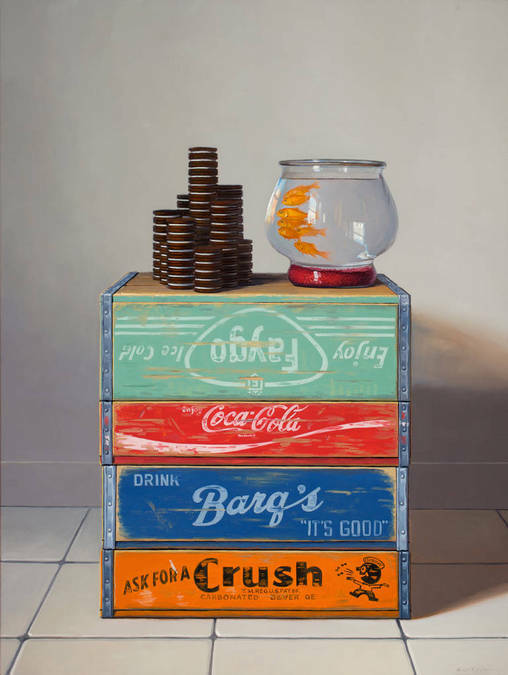 For those that have not seen the book, artists such as Wayne Thiebaud, Janet Fish, and Jack Beal were interviewed with images of their work intermixed. I'll often grab a copy at lunch and reread one of the artist's interviews. It's not a curator or critic talking about the work, it's the artists themselves and I love that. But in the ensuing 30 years plenty of artists have come onto the block and a book of this type with representation painters hasn't been done again. In tackling the same general idea, I wanted the images much larger and the questions directed more about their creative processes as opposed to the technical but that book was somewhat of an initial impetus. 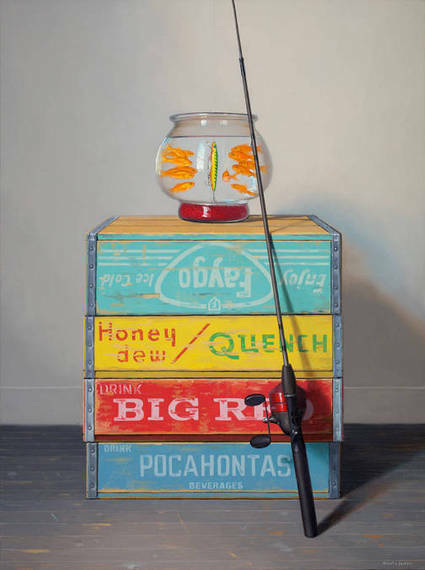 How did you choose the artists in "Behind the Easel"? This was really hard for me as there are tons and tons of talented artists out there and the last thing I wanted to do was exclude people. I respect anyone who has chosen to make this their life's path. However, I knew I didn't want an encyclopedia or "who's who" with a single picture for everyone, rather I wanted a somewhat intense and respectful look at a grouping of artists. My goal was to have about 12 pages per artist and reproduce them larger than I had seen any of them reproduced in a publication before. Simple math, and keeping the book to around 250 pages, limited me to about 20 artists. After much consideration, I set up 2 constraints. Firstly, I wanted artists that had caused me to drop my own brush and give up my own work to see what they were doing (and it takes me a lot to make me want to leave my easel). I've gone to their shows and dog-eared their catalogs. Secondly, I wanted artists who were identifiable enough that from across a room that I knew who did the painting without having to run up and read the nametag. 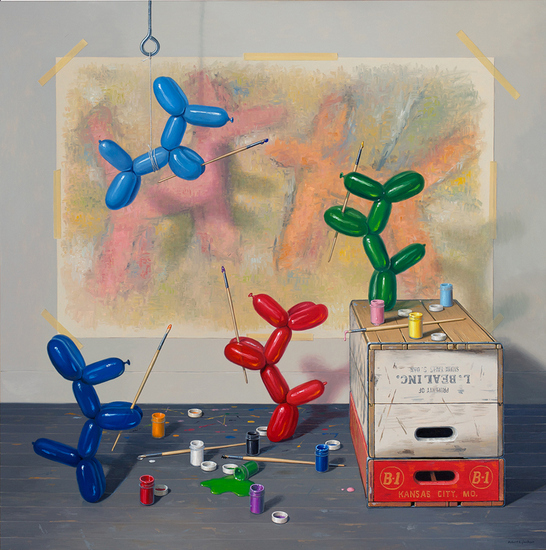 Which explains the subtitle of the book, "The Unique Voices of 20 Representational Painters"
Are you ever reticent about using humor in your work? I actually find it an incredibly challenging pursuit. Nothing is as awful as a stale pun or a one-trick pony. To create a laugh or smile that visits again and again is difficult. To a certain extent it is a balancing act to push it right to the edge without falling. But when all is said and done, if my work brings a little joy to someone's journey I find that pretty darn satisfying. What do your children think of your art? I have a very close family. My children are 22 (wow, 23 this month - Happy Birthday Becca! ), 19, and 10 and I couldn't have bigger fans than these three.